I cannot hide my enthusiasm that Lush have all kinds of new stuff! Here are some of my favourites that you should definitely try out! From my past publications you already know that organic is what I’m after. So here is the first product of the new Lush line. It’s called Yuzu and Cocoa. It’s a moisturising shower cream in an incredibly bright yellow colour and is a wonderful combination of citrus fruits and oils you’d simply want to eat right away! What I like is the idea of exotic Japan and the Japanese fruit Yuzu in it. The smell is very uplifting and resembles sweet orange. After I use the cream, my skin feels very soft and moisturised so there is no real need to use body lotion. That’s a plus, especially when you are in a hurry for work. Yuzu and Cocoa is the absolute mood lifter with its combination of Cocoa butter, Bergamot oils, Grapefruit and fresh Yuzu juice. Why not have a Cup O’Coffee while still in the shower? You can do it with the Cup O’Coffee exfoliating mask. Roasted cocoa extract and coriander oils make the skin soft and relaxed, while the addictive fragrance of coffee pieces and vanilla remove the dead skin and imperfections from your face and body. You could leave it to work on your skin for about 10 minutes and then rinse with water. For additional sweetness, Lush added Agave syrup and Vetivert. Then there’s the colour explosion of the Layer Cake soap. It is super fresh and soft. I don’t know about you, but this combination of colours definitely has a soothing effect on me. It’s not simply a soap in the shape of a dessert, it is a freshly squeezed juice for your body. Layer Cake’s scent is of a Brazilian Orange, but it contains much more than this. There is also fresh juices from raspberry, blackberry, grapes and pineapple. Yumm! Jersey Bounce is probably my favourite product from the ones you see. It is a shampoo that leaves my hair super clean and shiny during the day. Due to the big amounts of sea salt in it, it also gives extra volume. Jersey Bounce is a really sweet shampoo, the immediate scent being honey and lemon, that’s why it’s also quite sticky. It contains egg protein to strengthen and protect your hair, too. My hair gets greasy quite fast, but with this shampoo, I can as well wash it every other day. The orange product you see in the photos isn’t new but it’s worth talking about. The solid soap Brazilliant reminds me of Brazil, the sun, the sweet smell of oranges. Lush used fresh orange juice which makes my hair extra shiny and smells super nice of ylang- ylang and orange butter for this tropical feeling of freshness. What I’m most addicted about is the Lush exfoliants. If you remember the giveaway post from a while ago, there I talked about the exfoliant You Snap the Whip, which was an amazing body cleanser in black colour with a super sweet bubblegum scent. Too bad they don’t produce it anymore. Here, there are no surprises. Lush have created Rub Rub Rub polishing bar to exfoliate your skin for the feeling of smoothness. The colour of the scrub is soft purple and the scent is one of jasmine, mimosa and orange. Now that sounds fresh! I feel as though my hair has been super flat lately, so I think that I may be investing in Jersey Bounce! 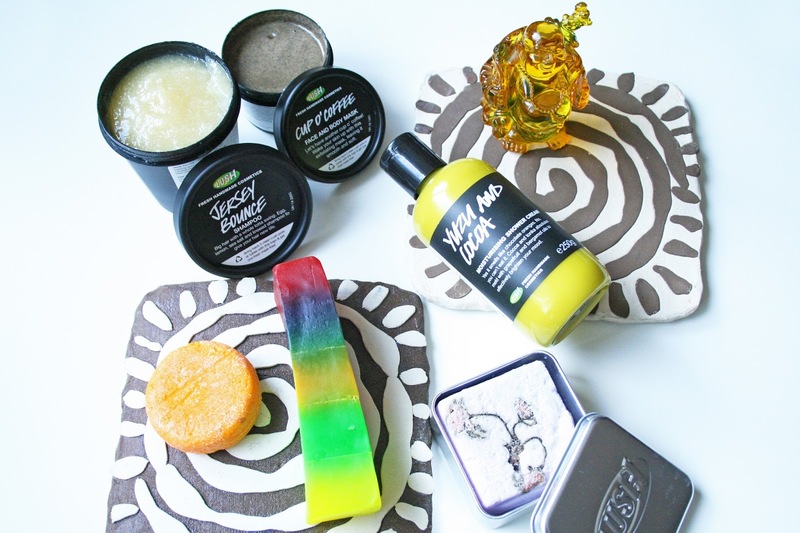 I absolutely adore Lush, I want everything in these pictures!